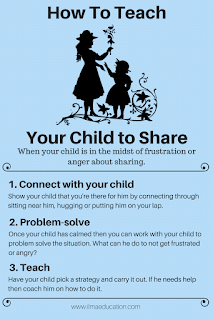 Let's face it, sharing is hard for children. It is something that is learned and children haven't had enough practice at it. What parents can do is to continually encourage their children to share from a young age. So start teaching your child to share early on when he or she is still young and is learning about the world and how to act in it. Be the model that you want your child to be. If you want your child to share then he or she needs to see you sharing. How else can your child learn without seeing how it's done in daily life? When you draw attention to how others feel, it'll teach your child about empathy so he or she will be more likely to share. "Look at how sad Ali is because he doesn't have any chocolate to eat", "Nur is so disappointed when no one shared the ball with her", "Adam has a big smile on his face when you shared your car with him" and so on. 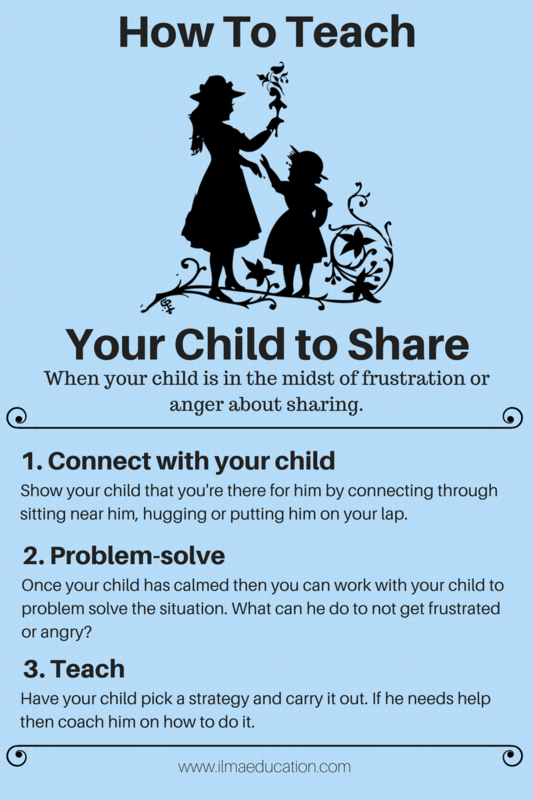 When you see your child or anyone sharing, point it out and give it the positive attention it deserves. "Oh my, thank you! You've shared this biscuit with me. It makes me feel so happy", "Aisha is such a good sharer! Did you see her sharing her play dough with Fatimah? Fatimah is glad now that she has play dough" and so on. 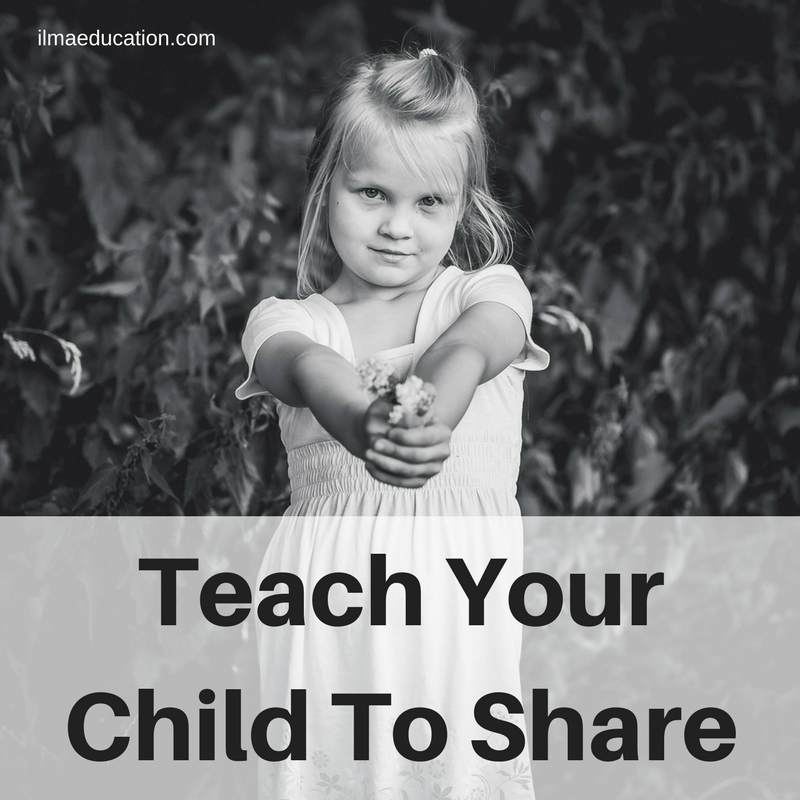 Whenever you have something just divide it up and ask your child to share it with others. For example, you could cut an apple up into quarters and ask your child to share them by giving the other pieces to his other parent and siblings. 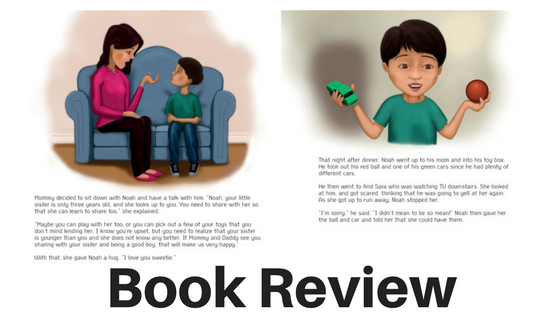 A good opportunity for your child to learn is through not just reading books that has sharing as the topic but also through discussing about what happened, how each of the characters felt and what else could the protagonist have done. 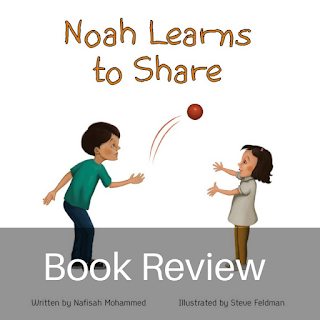 One such book to start a discussion is 'Noah Learns To Share'. Noah learns to share with his little sister after some guidance from Mommy and compromising from Noah. Noah has a little sister, Sara, who always takes his things and plays with them. She sometimes ruins them during her play as she is 3 years old after all. Noah has had enough when he came home one day and found Sara playing with his new toy car and ruined it too. So Noah starts to yell at Sara and says that he hates her. Through his mum's talking with him, Noah learns to share with Sara. 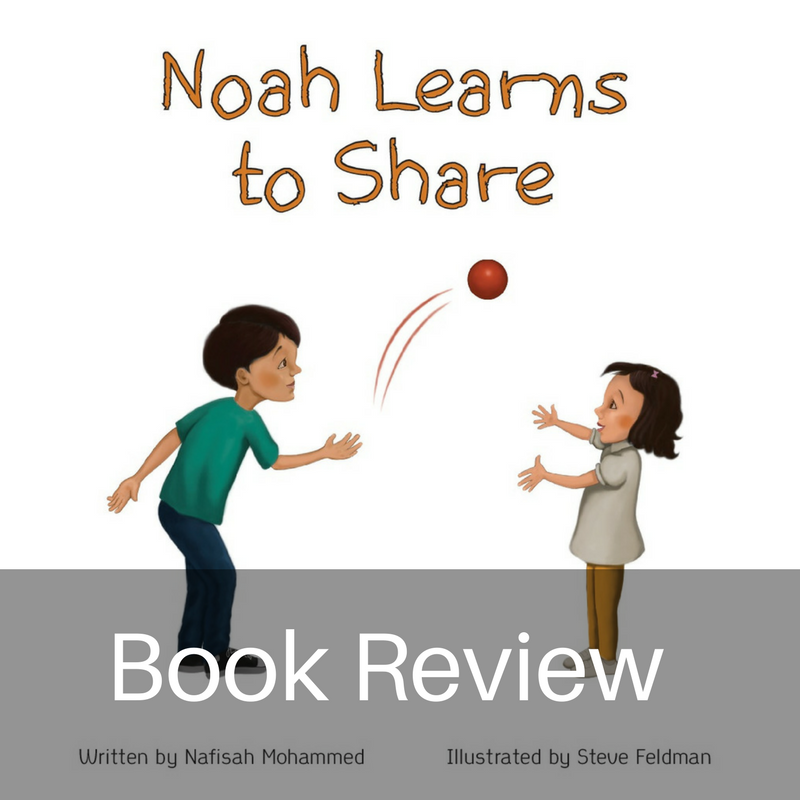 Noah Learns to Share has a good story line. Most older brothers and sisters can relate to having a younger sibling taking their things. The story builds up at a good pace with Noah having had enough the second time he finds Sara wrecking his new toy. The ending has Noah sharing and playing with Sara which brings the story to a nice close. However, I feel that the resolution could be done differently. Realistically, children cannot think when they're in the midst of a big feeling. They will not listen to you talking and teaching. You'd need to calm the child down first. So I would have liked to see Noah's mother trying to calm him down by connecting with him. She could do this by dropping down to his level to look and maintain eye contact with him. If he allows it then she could hug him or sit down with him on her lap. If not then a hand on his shoulder to show her support is enough until he calms down. Once Noah is calmed then she could acknowledge his feeling of frustration and anger at his sister. She could say, "You're feeling frustrated and angry at Sara. You have a right to be when she took your truck without asking and ruined it. What's not alright is for you to scream and yell at her when she's only little and doesn't know any better yet." So instead of mum talking and telling Noah what to do next, she can ask Noah what are some things that he can do. This will teach children to problem solve the situation themselves. Mum could say, "What can you do so that both Sara and you will be happy?" Mum would then let Noah come up with as many ideas as he could. After Noah has come up with several good ideas then Mum would have him select one that he could try. One suggestion could be that Noah shares a toy that he could play with Sara. If Noah needed help in selecting an appropriate toy then this is where Mum could help in teaching him. From this point, the story would continue on. Mum knelt down so could look into Noah's eyes and place a hand on his shoulder. Noah stomp his feet to let out his frustration at Sara. "Authubillahi minnashaytan nirrajeem," Mum said as she gathered Noah into her arms for a soothing hug. She lead them to sofa to sit. When Noah's breathing slowed down, Mum said, ""You're feeling frustrated and angry at Sara. You have a right to be when she took your truck without asking and ruined it. What's not alright is for you to scream and yell at her when she's only little and doesn't know any better yet." "I'm sorry I yelled and said I didn't like her but she makes me so mad sometimes," Noah said, looking down at the floor. "What could you do so that she doesn't make you get mad and so both of you could be happy?" Noah thought about it and said, "You could buy me a cupboard with a lock on it so I could put all my things in there. Or I could put all the things that I don't want her to touch on my top shelf where she can't see or reach them. Maybe I can just let Sara play with a few of my toys that I can share with her." "They sound like good ideas to me," said Mum. "Which one would you like to try straightaway?" Noah Learns To Share is a good book to read to your child to get the discussion started on sharing. The only thing I'd change is the wording on one of the pages to teach children to calm down first and then to think about problem-solving the situation. It'll also teach parents on what to do in this type of situation.